3mm 2x2 Twill - EPOXY. This panel has a 2x2 Twill weave pattern, which is the most commonly used weave pattern in the automotive industry. Our panels are constructed using high quality materials from reputable manufacturers in the USA. The carbon fiber fabric used in construction is woven by established companies across the US, which will ensure you get a quality fabric in your part. We use a crystal clear high strength epoxy resin in our panels to provide the clearest finish we can achieve. These panels have a high gloss finish on the face side and a fine matte finish on the backside. Our panels are also available with an all weather 3M 6035PC adhesive option. This adhesive covers the entire backside of the panel and has an easy to remove backing. Just peel the backing off, and you can adhere the panel just like a sticker. This Carbon Fiber Panel is available in sizes 12"x24" , 12"x48" , 24"x48" , 48"x48" , 48"x72" , and 48"x96". These panels are vacuum infused with a high quality/scratch resistant epoxy resin that is custom formulated for us here at Composite Envisions. Our panels are produced right here in our shop. Due to slight variances in material, we give these panels a range of +/. These panels are typically cut by waterjet. However, due to time constraints they may be saw cut. Therefore, these panels are given a dimensional tolerance of +/. All of our panels 1.5mm or thicker have a core made with no crimp carbon fiber along the 0/+45/-45/90 axis to ensure the most uniform layup along all axis. This will yield a panel that is structurally sound for most applications. We can adjust strengths in various axis if more strength is needed in one direction without increasing weight. If these panels on our site do not fit your specs we produce these panels here in house and can offer the following options. Costs and MOQ's vary. Lead Time 3-10 days, costs vary. Custom Fiber Orientation - UNI , 0/90, 0/45/90 or to customers spec. Custom Layup - We can use multiple layers of 3k carbon, few layers of 12k or build panels with color all the way though each layer. Lightweight Foam Core Options - Increases rigidity while minimizing weight. Resin Options - Polyester (least expensive) , vinylester and high strength epoxy. Heat Tolerances - Resins available from 175° F to 350° F high temp and flame retardant. Standard size 4'x8' with max size up to 60"x110" (for structural applications only) with a max thickness of 1 thick, minimum thickness. Can create panels from any fabric we sell on our site. Finished Part Production - With a supplied dxf/dwg cad file, we can waterjet your panels into high quality finished parts that arrive at your doorstep. Our panels are NOT UV Protected. To ensure longevity of the panel, we highly recommend a clear coat with UV Protection be applied to the face of the panel for panels which will be exposed to sunlight. Finish Fabric Used (Model #). Weave Style of Cosmetic Side. 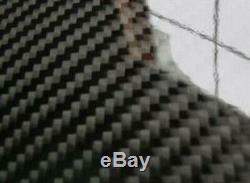 The item "Carbon Fiber Panel. 3mm 2x2 Twill EPOXY-24 x 48" is in sale since Friday, June 3, 2016. This item is in the category "Business & Industrial\Other Business & Industrial". The seller is "elitemotoring" and is located in Wausau, Wisconsin. This item can be shipped to North, South, or Latin America, all countries in Europe, Japan, Australia.